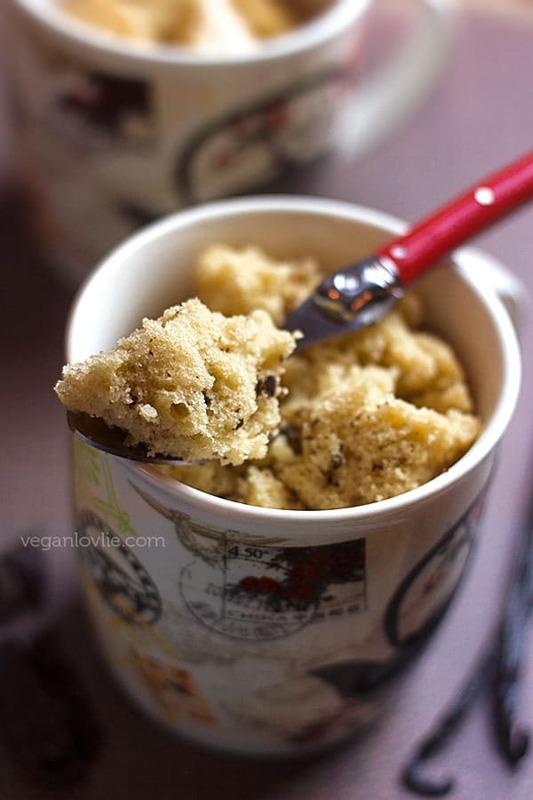 A simple one bowl vegan vanilla chocolate chip mug cake that neither requires a microwave nor oven. It is steamed and results in a moister, lighter, fluffier and spongy texture. Steamed in batches of one or two, these cozy hot mugs of cake have probably quite literally been stealing the cherries off the ever so loved cupcakes these past couple of years. It seems that mug cake recipes have been popping up on the internet like mushrooms. Many of these mug cake recipes can be whipped up in a couple of minutes in the microwave. 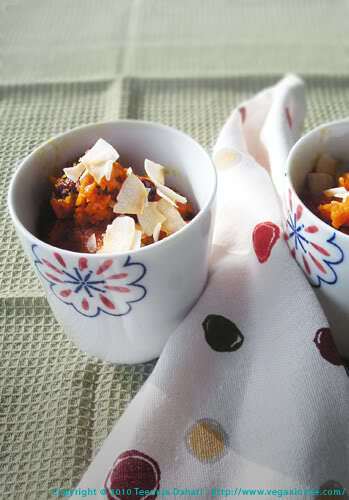 My version however, is a steamed one inspired from steamed cakes that are also known as puttu or poutou. In Mauritius, they come in a few versions, namely inherited from the South Indian puttu (made in a puttu maker) and Chinese smiling cakes (made in small bowls in a steamer). 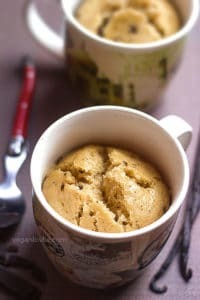 Retrieved from the archives, an oldie but goodie mug cake recipe of mine called for a revamp lately as I was in the mood for some steamed cake. Back when I initially posted this recipe, mug cakes were not even that popular. I remember not getting any results back from an internet search at that time as it was the time when cupcakes were the star of the show; they always have been as a matter of fact. With a sparsely equipped kitchen, I had no moulds to bake cupcakes back then, and the only vessel I had on hand that could contain the batter happened to be mugs. The microwaved version of these cakes in a mug is what apparently gives them their appeal for a quick dessert made in minutes. We no longer use a microwave. So, this mug cake is certainly not a 2-minute one. All you need is a steamer or deep pot with a steamer rack/tray, no microwave or oven necessary. 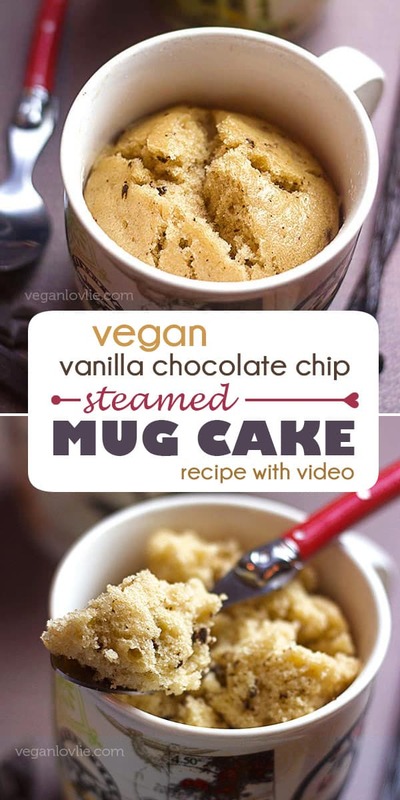 It is intended to be enjoyed for what it is – a steamed cake in a mug. 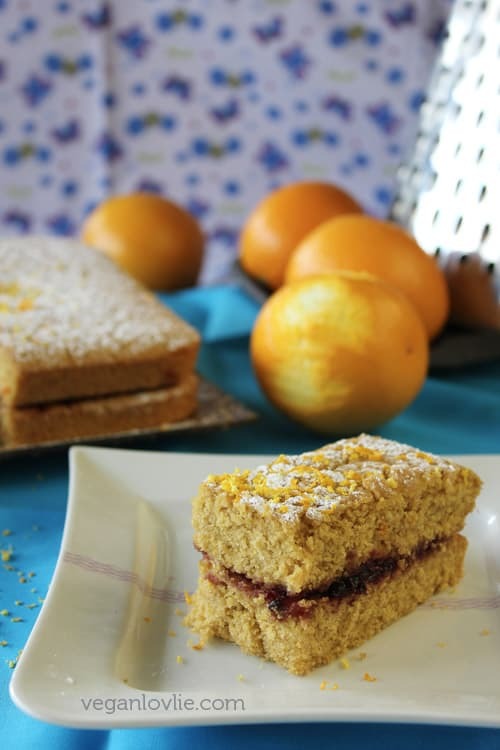 Steaming results in a cake with a moister, lighter, fluffier and spongy texture. Even just digging your spoon into this pillowy sweet treat is cause for excitement, let alone the melt-in-the-mouth smoothness. The recipe is a revisited version of the old one. It is not dense at all and calls for less oil. Omitting the oil will yield a drier, less moist cake with a slightly rubbery texture which is probably kind of still okay if eaten with a custard sauce, fruit coolie, or this oil-free chocolate sauce. I just love mine plain served with a nice cup of tea. You may mix all the ingredients into the mug itself if you want to save washing up an extra bowl afterward. But I like to lightly grease the mug so that the cake can be easily removed or detached from it. This cake can be served in the mug itself or demoulded. It is a fairly generous portion; you may want to divide the batter into smaller cups or ramekins for smaller cakes. Maple syrup is my preferred sweetener in this recipe. I have also included another version of the same recipe that calls for granular or soft sugar instead with adjustments to the liquid. As for flour substitutions, white spelt flour is close enough to all-purpose flour. So, these may be swapped. You may also use whole wheat or whole spelt flour. You may need an extra teaspoon of non-dairy milk if using whole flours. This cake might also work with a gluten-free flour mix but I haven’t tried it. So, if you do try it with a gluten-free blend, let us know of the results. Watch how to make this mug cake in a video. *It is important to get all spoon measurements levelled or else the proportions will be off and may not produce a cake with the expected texture. If you have an electronic/digital metric scale, use it. Set a steamer to heat beforehand. Make sure to add enough water into the pot to allow 25 minutes of steaming at medium-high heat. Lightly grease a mug or ramekin and set aside. Add all the dry ingredients, except the chocolate chips, into a mixing bowl. Whisk together. Make a well in the centre. Add all the wet ingredients. If using granular or soft sugar, add it into the wet ingredients. Stir and mix the wet ingredients in the centre first. Then mix with the dry ingredients to make a rather thick batter. Add in the chocolate chips and mix. Pour the batter into the mug. Do not fill the mug more than half-way as the cake will rise twice the volume of the batter. Once the water is steaming, quickly place in the mug in and cover immediately to avoid losing any heat or steam in the pot. Steam for 25 minutes straight or until a skewer/toothpick inserted in the middle of the cake comes out clean. (Do not uncover the pot during the first 20-min steaming time). Turn off heat and allow to cool in the steamer for about 10 minutes. Remove and let cool at room temperature. Enjoy warm or cooled. A simple vegan vanilla mug cake that neither requires a microwave or oven. It is steamed for a moister, lighter, fluffier and spongy texture. It is important to get all spoon measurements levelled or else the proportions will be off and may not produce a cake with the expected texture. If you have an electronic/digital metric scale, use it. 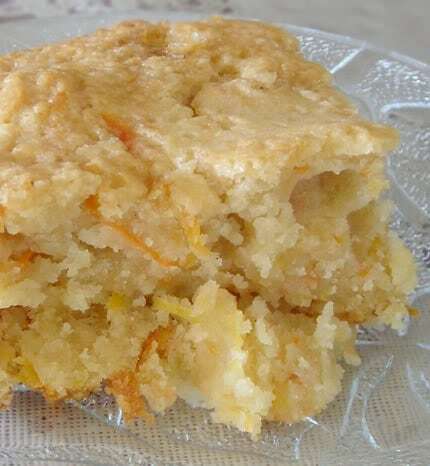 Omitting the oil will yield a drier, less moist cake with a slightly rubbery texture. It is up to you if you want to substitute it with apple sauce. I cannot vouch for the same moist tender texture. White spelt flour is close enough to all-purpose flour. So, these may be swapped. You may also use whole wheat or whole spelt flour. You may need an extra teaspoon of non-dairy milk if using whole flours. Maple syrup is my preferred sweetener in this recipe. I have also included another version of the same recipe that calls for granular or soft sugar instead with adjustments to the liquids. Pin this recipe for later. Follow us on Pinterest and come pin along with us. Thank you for sharing this recipe will definitely try it. You make it sound so easy. Would be great if you could share a recipe of poutou(steamed version) Please ???? These little mug cakes look wonderful! Hubz birthday is on Monday so that might be the perfect occasion to try this recipe – YUM! !